A butterfly can flap its wings, according to the lore of chaos, and it can stir a hurricane on the other side of the globe. So: could a president lose his life on one great landmass, causing an acre of its bulk to take up residence on another continent all together? He did. And it could, and did. But the story began further back, a long, long time ago, when Liberty was just a squalling babe. In 1215 a sad apology for a king signed a piece of paper on the banks of the Thames in England. He was tolerated by the barons simply because there was no-one else to fill his expensive shoes. An army of considerable might was camped there, while King John put his name to what became the Magna Carta. It is not the English who have commemorated this with any pomp, but the Americans. Runnymede, by the river, houses a number of memorials. The American Bar Association’s is mighty indeed: a rotunda, a domed monument with a ceiling painted blue and covered in stars. Here, it declares, freedom, under law, was born. The soft squelch of a wax seal: and almost eight centuries later, we marvel at the effects of this temporal butterfly. America traces a direct line from its constitution to the law enshrined by King John’s seal, that day. The monument is but a stone’s throw from the most extraordinary phenomenon: an acre of America overlooking the Thames. It commemorates the loss of a president. And not just any president, but an Arthurian one: a golden leader who gathered knights about him as the old English king had done so at Camelot.President John Kennedy, the 35th president, lost his life on November 22nd, 1963. Faced with the enormity of events, the British Parliament met to discuss how to help the American people mourn their leader’s death. Not only that: but how could they show their deep rooted conviction that Kennedy lost his life defending that very same liberty set by a wax seal centuries before? By December 10th, it was decided. An acre of land at Runnymede would be gifted to America. And on it would be set a monument, so that liberty and its great cost might never be forgotten. It was brilliant August sunshine which met us on that hill today. We parked and walked to a gate at its foot: and the moment we stepped through, we were on American soil. Every step of the way holds symbolism. It is little short of a sacred walk, modelled on John Bunyan’s Pilgrim’s Progress. Granite setts, each totally individual, form the winding path; there are 50 steps, to represent each state in the USA. 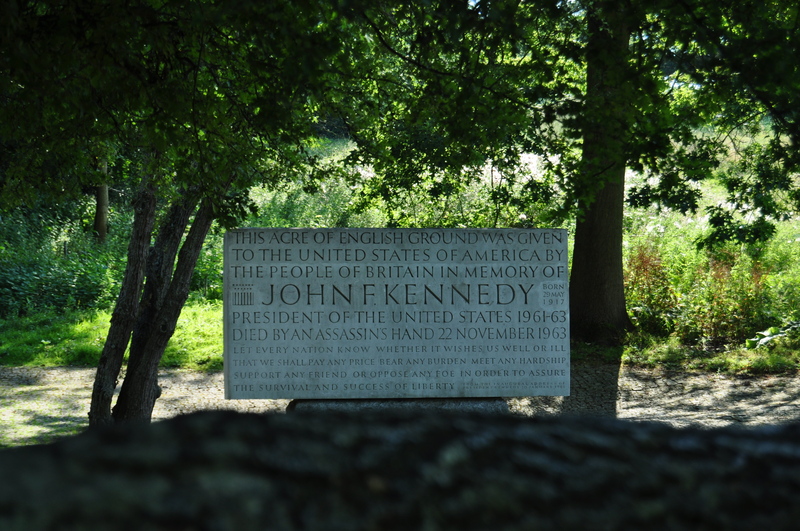 The memorial stone, made of Portland Stone estimated to be about 100 million years old, carries an inscription including a passage of Kennedy’s inaugural address delivered in 1961.It sits on a pad of granite to represent the shoulders of the many. Behind the stone is a tree whose leaves turn blood-red every November, an American Scarlet Oak. The only people there were Maddie and I. The rabbits fed tranquilly on the other side of the site’s ha-ha, a ditch to keep out animals. The sun shone down on an acre which is artfully fostered as a wilderness, with great flat stone seats and a vista taking in the hustle of the Thames below, and the road through Runnymede. Time has rendered this place timeless. A reflection of freedom. A pause in the busy world below. Because a butterfly can flap its wings, and stir a hurricane on the other side of the globe. Posted in Places to visit, Quirks of HistoryTagged acre of land, American Bar Association, history, John F Kennedy, Magna Carta, monument, runnymedeBookmark the permalink. Very romantic view and lovely pictures. True. Romantic view. I think it’s the Camelot business that does it for me. Can’t resist a metaphor. You’re welcome, Chris 🙂 Thanks for leaving a comment. I am so deeply touched by this. For every American who was alive on that terrible day there is still a very sad sense of loss. This memorial stands as a marker that the bonds of deep understanding and respect do continue to hold a link between our two countries and when something tragic strikes, there is genuine compassion. The setting is remarkably serene and peaceful. I couldn’t take my eyes off the photos, Kate. It’s a serene place, Debra. It used to be very busy, when the monument was first opened, but over the years has become almost deserted. I am torn: I would love more people to know about it, but would hate to see it crowded all the time. It is at once very English and very American: a reflection of who we all are. It is a beautiful place, Sidey. This makes me recall the veneration in which JFK was held before the age of cynicism set in, and the enormous shock and grief worldwide after the assassination. This gift was a truly fitting reaction to the ideal, whether rooted in reality or not. Excellently put, Col. An international statement to an event which affected the whole world in its way. How I wish there were leaders today who could attract the respect and liking most of ‘our’ world had for him at that time. 🙂 Thanks, Madhu. Your travel writings are now essential reading for me! Beautiful, Kate, the memorial and your writing. You’ve captured the serenity and the poignancy so well. I just read about the butterfly effect. Fascinating. Two of my favorite authors, Ray Bradbury and Michael Crichton, used this term in their books. Thanks for sharing this, it touched me…..
You’re welcome, Annie: thanks for leaving a comment. Hidden within your beautiful prose was a history lesson! Many of us older Americans remember Kennedy’s assassination vividly remembering exacting where we were and what we were doing when we got the news. You made me want to google King John to read about him. I didn’t know this memorial was there. Thanks! You’re welcome, Kate 🙂 There are so many connections between Britain and the USA, and this is among the most beautiful, I think. I was just shy of 14 years old when President Kennedy was assassinated. Like all of my generation, I will never forget that day or that time in history, when the world as I knew was shattered. 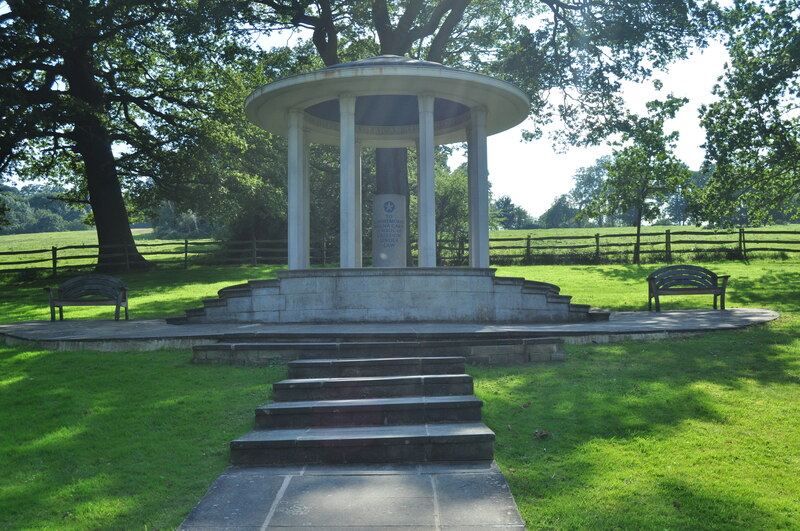 I did not know of this memorial to President Kennedy at Runnymede. It is so calming to know it is there in such a peaceful setting after such a violent event. Part of the Olympics coverage here has been reflecting, via Tom Brokaw, the connective threads of Great Britain and the United States. None could be more fitting than this tribute. There is a version, one of four or five in existence, of the Magna Carta at the National Archives at the Smithsonian in Washington, DC. We have seen it, so old and yet so new, under glass. It means I can have a picnic in America, Celi, and be back in time for Coronation Street. I too did not know of this memorial in England. Stark and simple, it is fitting, I think. Like Penny, I’ve seen the Magna Carta at the National Archives in DC. I love wandering around in there, amongst all those really, really old pieces of parchment and paper. So much to read, and so little time, Andra. The things I learn, coming here to read! I love the way you process them. I’m always turning over tidbits, but I don’t have your journalistic gift for sharing and binding them. My discoveries slip into the little fictions and hide. What a lovely memorial gift . . . an oasis on the banks of the Thames. A living place until the end of time, Nancy. My political beliefs were shaken to the core after President Kennedy’s assassination, and his brother, Robert’s, slaying 5 years later. Truly … innocence shattered. Thanks so much for your beautiful piece and photos. Kate, I love the historic perspective you shared. I never knew this site existed. How far is this from London? It is just outside Windsor, not far from the Crown estates, so I should think about 45 minutes drive or so, Judy. I’d love to see it. From our previous visit though, we mostly traveled by the Underground. As I have told you before, I’m 175, so it will come as no surprise when I tell you that I can remember it being made. I first saw it in the very early stages, and open space that has matured over the years. The bond between the two countries is very important. There are many that would try to break it. Myfanwy, how brilliant that you can remember it being built! Its symbolism is extremely complex and the directions for building equally so. I suspect it must have been a high profile opening. How interesting, I had no idea this existed. Thank you, Kate. I had no idea this memorial existed. Worth a visit if you are ever over here, Linda! I never bought into that butterfly flapping its’ wings stuff, surely the real wings in the story are American ones? Mustangs, B52s, and Stealth fighters. Their wings really have altered the course of history…. True. Big wings too. This post was about cause and effect: the butterfly metaphor argues that a tiny action in one place can have a disproportionate effect somewhere else. I cherry-picked three disparate events and highlighted the links. That is not to say that there are not much darker links, and more ham-fisted actions which stirred catastrophes. That I can agree on, one careless “word” can create a lasting wound. One moments inattention cause disaster.